After hustle and bustle of Black Friday, shoppers are encouraged to support their local businesses on Small Business Saturday this weekend. the National Federation of Independent Business estimated that 108 million shoppers spent $12.9 billion on last year’s Small Business Saturday. 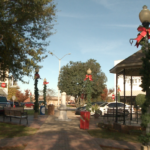 This year, local business owners in Troy are hoping to see more customers shopping local. Different stores are carrying sales and giveaways hoping to attract people to the businesses. Owners say it’s important to stay local because the money spent will be used to strengthen the local economy, fund schools, and provide jobs for the community. “Our motto this holiday season has really been to think local first before you go and click ‘add to card’ online, and support people that you don’t know. Keep it in your community and think local first” small business owner Mallory Morgan says. Local business retailers say shopping locally can create a more personal experience hat you may not find elsewhere. “Well, as small business owners, we know the importance of each and every individual customer that we have that comes through these doors. It’s greatly appreciated and it’s a huge impact on our business,” Morgan says. “One thing, we know a lot of the people that come in here and we’re interested in the peron, not just selling,” thrift store vendor Joyce Davis says. This will be the 8th year the state has held Small Business Saturday. Earlier today, Governor Kay Ivey signed a proclomation declaring November 24th as Small Business Saturday for 2018.